After six months of getting up early on Saturday mornings to run long runs, I am as ready as I'll ever be to run the inaugural Rock N Roll Seattle Half Marathon this Saturday. In fact, I can't wait to just actually run it. I am not expecting to be fast or anything miraculous like that. I plan to walk when I take water breaks at every mile, and to take photos. What's the point of running it if I don't have photos, LOL. This is my first half marathon (13.1 miles). I ran the Honolulu Marathon (26.2 miles) in Hawaii in December 2000. Yes, I think I'm doing it backwards! Tonight I'm packing up my running gear, including my little clip-on iPod Shuffle. It is 2 GB and I had a lot of music on there before. But I picked out about three hours worth of my favorite running songs and only put those on there. I don't want to have to reach down and skip songs. I only wanted the songs I really want to hear during the half marathon on there. 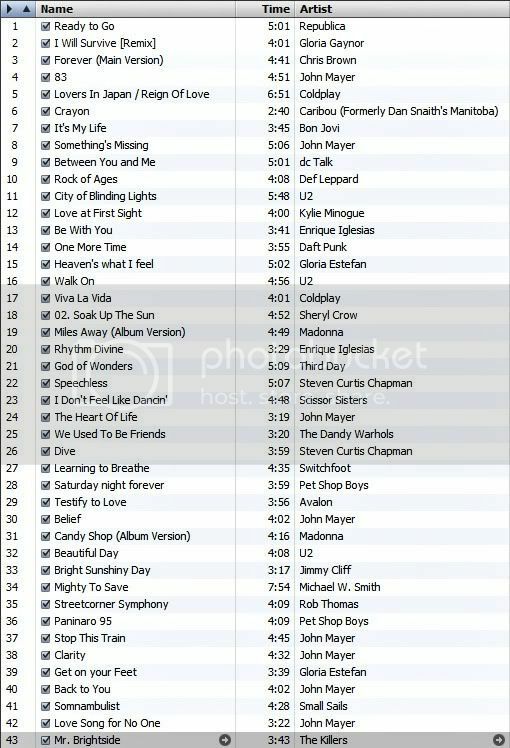 So here is my playlist. If you run, I'm interested to know what your favorite running songs are. Today Todd had lunch with a couple of friends that he used to work with at TD Waterhouse (now called TD Ameritrade). Todd and his friends Dave and Moji worked at TD Waterhouse on their financial advisor website. In 2005, TD Waterhouse moved their whole IT department to New Jersey, then merged with Ameritrade. Nobody in the whole department took the company's offer to move to New Jersey, so they were all let go with a severance package. Dave and Moji have actually worked as contractors at Todd's new company, and they've stayed in touch with regular lunches. I'll "see" you tomorrow night from the Emerald City! I don't have a lot of these songs on my ipod...I'll have to ask Eric if he has them and could put them on mine. He has like 18,000 songs in his itunes. Ahhh...I see a California Pizza Kitchen box! Yum!!! Nice that they've stayed in touch! San Diego....New Jersey....San Diego....Yep! I'd have stayed in San Diego too!!! Good luck with the preparations for the run, and with the run itself! I maybe could go with the Scissor Sister tune for my runs, otherwise I prefer euro-disco, with the beat at the same pace as my steps. I almost never listens to it otherwise, but find it good for running. The Def Leppard one is great for keeping you pumped. For some reason, I love to rock out to early 80s music, maybe from years of Sunday long runs listening to "Resurrection Sunday" on the radio. Good luck on Saturday, and I hope you get great weather and have plenty of energy to explore Seattle before and a little after. Safe travels! Best of luck and congratulations! I am cheering for you here in Texas! I will be praying for you and Todd as you run this weekend. I am sure you will have a blast. Can't wait till you get home. We are overdue for a date. Great shot! Love the iPod list. I don't run but I power walk. I find the songs that get me moving the most are Shake It by Metro Station and Hot & Cold by Katy Perry. I immediately start walking faster when I hear them. Good luck in the marathon!!! LOL at Anne's reference to "Resurrection Sunday!" She is such a SD girl! Love the playlist. I'm listening to a lot of '80s stuff when I run right now. Good luck in Seattle. Can wait for all the pix! great playlist - there are many songs I´m loving!